As humans, we make thousands of choices throughout the day. If you’re someone who has been choosing different workouts, in different locations, at different times, this can give you a sense of feeling excited and entertained. Variety could also leave you feeling unintentionally scattered and even wasting time on a workout that will never be “the one” to help you reach your goals. When you choose a studio, it doesn’t have to be the one forever, but see if you can make it the one for at least long enough to see what it has to offer. More options doesn’t mean more results. There’s power in making a choice. Jumping around to different classes makes it challenging to figure out which workout is right for you. The first time you take a fitness class, you aren’t getting the full benefit of the workout. Since your first experience is focused on getting your footing with the basics, you’ll typically feel one step behind. Without giving your body a chance to really understand the philosophy of a fitness program, you aren’t giving the workout a fair chance. Just like in a relationship, it takes time to get to know the real philosophy and benefits of a workout. Getting comfortable takes consistency, and if you’re jumping around haphazardly, you aren’t getting the full picture. The main reason you want to commit to a fitness program is so your body is consistently challenged. Challenging your muscles with specificity is the way progress is made. You’ll get better at the exercises which you are training to do, and you’ll get stronger with progressive intensity in your training program. For instance, if you’re training for a weight lifting competition, then the best way to improve your skill is to lift weights. If you are training for a field hockey game, the best way to get more tact is to play more field hockey. The more specific you are in your training, the better you’ll get in that skill. The key to getting stronger in each area is to challenge your body with higher intensity (i.e. more weight, more sprints, etc.) to surpass your prior capacity. That doesn’t mean cross training should be ignored. An ultra marathoner knows that consistent running will always be the # 1 training program to prepare for a marathon, but that doesn’t mean they won’t practice other forms of fitness to keep their body balanced. Some workouts are better for building leg strength, while others work on building cardio endurance. When you’re thinking about what to include in your fitness program, it’s important to look at the different areas of strength you want to build. Taking a yoga class might not make you a faster runner, but it could inhibit the damage of a higher impact workout by building your flexibility. The key is to build your routine based on which areas you want to build strength, then find consistent workouts to challenge you in those areas. It helps to have a community to keep you accountable. Being part of a regular community holds you accountable because they know when you aren’t in class! Getting to know your instructors and your fellow classmates is a social incentive to drop your excuses and really commit to your own progress. Plus, it’s more fun when you can build relationships and focus on that priceless human connection! Exercise might not be enough to meet certain goals. It’s important to remember some goals are more complex than just burning calories. If you are looking to meet a specific body composition, you should consider factors like nutrition, mental health, and even biology to create attainable goals. Not everyone is built the same, so you don’t want to create unrealistic or impossible goals for yourself. For instance, if you are a cardio-lover, then you’ll want to be prepared for your body to crave more energy, which will require more carbs and fats. If you’re trying to lose weight, more cardio could actually be counterproductive if you don’t have a proper nutrition plan in place. But, if you’re looking at exercise for mental clarity and energy, then cardio could be just the right program for you. Self awareness is key when setting powerful fitness goals. Take the time to assess how much time and effort you are willing to give a program, because the mental energy you spend at the beginning will be rewarded over time, when you start crushing those milestones. And, once you’ve made your goals, if a program is no longer helping you reach them, trust your instinct to recalibrate when necessary. 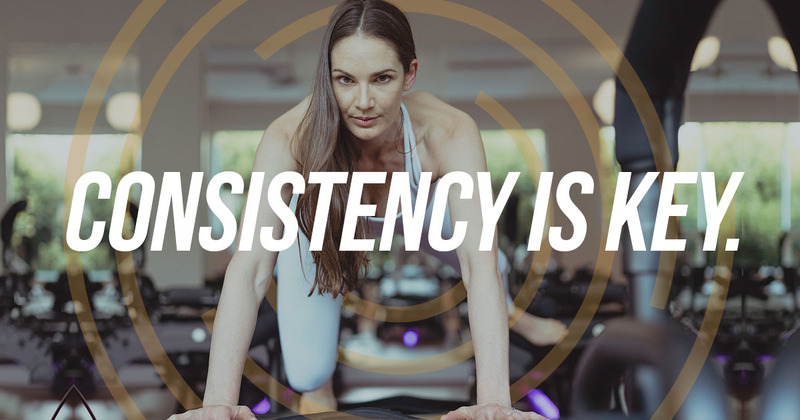 Looking to commit to a fitness program in 2019 and take your health and wellness to the next level? We’re offering $30 off the first month of VIP Unlimited Membership in January! Just email Connect@CORE40.com to sign up.